visual design, interaction design, and prototyping. This application was another exercise in designing a service based app to give the user a more enjoyable experience. The aim was to make the task of booking a spa service, for example a massage, simpler. The UI demanded a clean, modern look, as well as thoughtful micro-interactions that were pleasing to the eye. The use of the color blue is often described as peaceful, tranquil, secure, calm, and orderly, which is why it has primary dominance in the layout. Usability was a key component as well. The three-click rule (or myth) didn't apply here. What really counted was ease of navigation. I continued my traditional routine of sketching out some icon ideas to see where the design could go. After a few iterations, the client insisted it would be best to use the brand logo for the app icon. I reluctantly agreed. The final icon stands out amongst the crowd, but it's difficult to know what the app is or does from just the brand logo. You win some, you lose some. These sketches were the beginning phase of conceptualizing. They allowed me to brainstorm and get my ideas down on paper. They also helped me to show, not tell, the client potential problems and how I was going to solve them. Sketching sometimes also helps me to better understand the project. 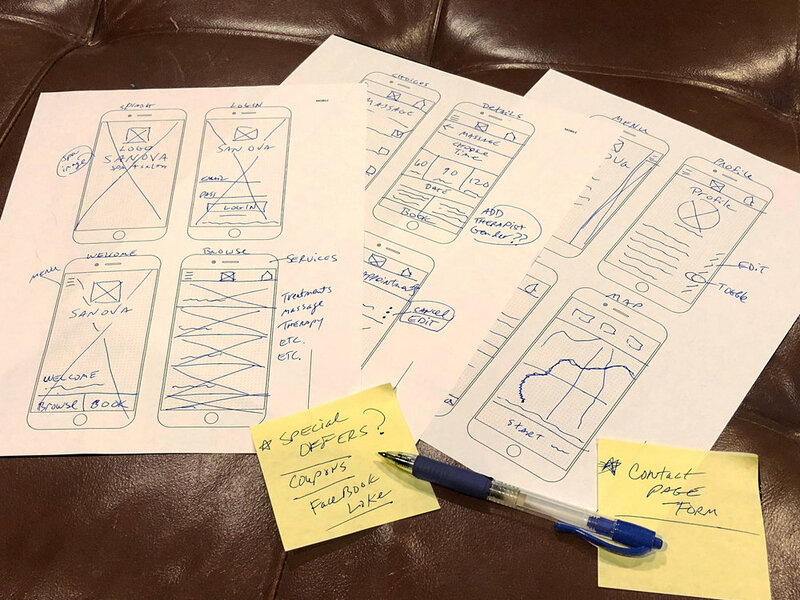 After drawing sketches of the user flow and screens, instead of wireframing low-fidelity mockups, I decided to go ahead and create a high-fidelity prototype. This interactive prototype was created with Proto.io, an online prototyping tool. The prototype can be viewed here.